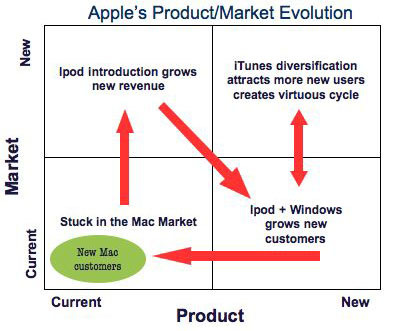 In 2005 we published a piece, “Apple’s Trojan Horse Is Working Well” which detailed how the tried-and-true Ansoff Matrix (products/markets) is useful in illuminating the phenomenal interaction of product and market development strategies Apple pulled off with its iTunes software, iTunes store, and iPod hardware. The piece was popular with readers then, so we’ve brought it back. We’ll update it, with a look at the iPhone phenomenon, in a future article. Here’s the original piece…. Apple stock continues to perform well, spurred on by sales of its iPod music, and now video, player. The music player market is hot and likely to remain so until 2007, which means Apple has plenty of good quarters ahead. Even better for the company, in the past year analysts such as Steve Milunovich of Merrill Lynch have stated that sales of the iPod are going to drive increases in computer sales, as new customers become accustomed to the Apple brand for the first time. As was predicted several years ago the iPod has become a , introducing Windows users who previously would not consider a Mac to the Apple user experience. 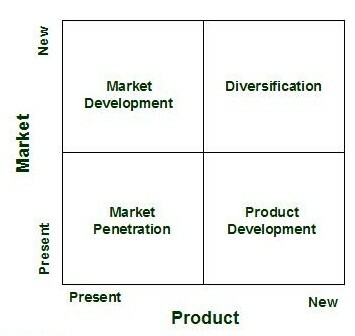 The Product/ Market Matrix provides a useful tool for thinking about this evolution. Published by Igor Ansoff in 1965, it is still incredibly useful for focusing one’s thinking about growth. Ansoff worked at ITT in an era of large conglomerates. His work helped firms rationalize their investments, and logically consider the risks and rewards of growth options. For most of the 1990s Apple was stuck in the personal computing world. Rather than adding customers and products, it shrank in market share and abandoned some markets (handhelds, printers). It was plainly stuck way down in the lower left quadrant, with little in the way of great growth prospects until the new iMacs, released in 1998, spurred interest among existing customers. The message of the market was clear. Making Macs better was not the problem. The market needed something more compelling than a computer that was slightly better than a Windows PC to convince new customers to give the company money. The iPod was the perfect rabbit to pull out of the hat. Apple’s core audience is multimedia-oriented, so a Mac-ish musicplayer was a step in the right direction. It also helps that Apple is well-known for charismatic product design; the public is a little more willing to give an Apple innovation a try. When early models got rave reviews, even Windows users who were deep into downloading wanted one. Once the iTunes software was released on Windows the iPod zoomed. In Ansoff terms, a successful Product Development strategy that succeeded immediately had positioned Apple for a Market Development strategy. Suddenly Apple was not just developing new revenues (upper left), they were also growing a new customer base (lower left). Then came the coup de grace. The iTunes online music service was a diversification strategy which took Apple out of its traditional business model—cool, elegant, user-friendly hardware—into a retail services entertainment business. Everything about the business, from frequency of customer contact to how profits are taken, is different. This diversification benefits Apple in two ways. First, it provides an opening into media distribution that may be a future path for the firm. It’s clear to many observers that personal computers will not be the only centerpiece of tomorrow’s digital entertainment universe. Providing an assortment of electronics gear and content gateways may be preferable. Second, it sets up a virtuous cycle. The more people who use iTunes, the more these new customers are likely to try an IPod or even a Macintosh product.